The boys had a good time trick-or-treating tonight, although amazingly I think that they actually had more fun handing out candy once we got home. We live at the end of a dead-end street so we don't get lots of visitors but the ones that ventured here were greeted by two talkative little boys with fistfuls of candy! "I want to be somebody else!" "I want to be somebody else!" This is what my five year-old son told me as I put him in the car after school today. I kissed him, told him that I loved him, that he was "my David" and I was so glad of who he was. Truth is, though, that at times, all of us wish we could be someone else. We look at other people and think that somehow they have it made. It is the old "grass is greener" syndrome. It can be tiring dealing with our own problems, insecurities, and flaws. But God is our caring parent in heaven who wraps love around us and tells us, "I love you just the way you are." What did you do with your Sunday this week? Was there lawn work to do? Household Chores? Sporting events to attend? Shopping to get done? Maybe you had to finish up work from the office, or perhaps you physically had to be at work. We live in a 24/7 world. Sunday often feels like just another day, a mere continuation of the week in which we need to see how much we can fit into one day. We may even claim that we are relaxing, but we even tend to relax in fast-forward. There are so many places we need to be - sporting events for our children, parties to attend, people to see, and the list goes on. I'm tired just thinking about it. Sometimes I feel like I need a rest from the rest! The Bible tells us that God created the world in six days and then took a break. "God blessed the seventh day and made it holy, because on it he rested from all the work he had done in creation." (Genesis 2:3) Yes, God took a rest, but we don't seem to feel we are entitled to the same. The little voice in our heads tells us there is something more to be done. Indeed, there usually is. The to-do list is not a figment of our imagination. The fact is, though, that while there are always things that could be done, they do not necessarily need to be done right now. The world will not come to a crashing halt if we step out for a little while. We need rest, true rest, to engage in recreation, a re-creation of our spirit. We need to quiet our souls, engage in prayer, and reconnect with nature even if it is just by sitting in our backyard or by staring out the window. Most of us don't even know what it is to be still anymore. If we sit still for more than a minute, we feel unproductive. Yet, that very stillness serves a purpose greater than we realize. It gives us a chance to listen to our souls and the God that speaks to us there. It gives us the opportunity to pay attention to what is around us, to use our senses to take in this great big wonderful world that God has given us. God was on to something when He took a rest. He gives us permission to do the same. In fact, God mandated it with the commandment to "Keep Holy the Sabbath." We have the go-ahead from the Almighty to take a break from the to-do list. The ultimate boss has told us to take the day off. Now we just need to obey. The past couple of days have been very busy, but in a good way. Last night was my watercolor workshop. What a wonderful evening! I had a great group of people, many of whom had not picked up a paintbrush since they were children and all of whom went on to create amazing pieces. Each one of us has that creative spark within us and my experience with the workshop last night only reinforced that belief. They asked me to come back and do another one in the Spring. I'm already looking forward to it. Today there was a Catholic School Teacher's conference, so David had the day off from school (oh, my, wasn't he happy about that!). I took the boys to my parents' house so that they could get to see David (something that they don't get to do as much now that he is in school) as well as so that they could watch them while I went to meet with my spiritual director. I had a good meeting with her. A lot is going on in my life right now and I always enjoy talking to her about it and working with her to find God in the chaos. After my meeting, I met my parents, the boys, my sister and her youngest son, at McDonald's for lunch. They just built one of the new upscale McDonald's near where my parents live and the kids have been looking forward to checking out the new play area. Tonight was our parish Halloween party. The boys (also known as Oscar and Cookie Monster for the evening) had a good time, and even I enjoyed myself. There was a DJ and we were doing dances. It has been a mighty long time since I have done the "chicken dance" and the "hokey pokey" but it was fun! The boys didn't get to bed until 9 pm but once in a while, that is OK. So, it has been a good couple of days. 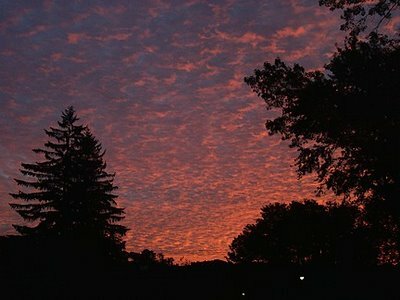 I took this photo of the sunrise a few days ago. I thought it was a beautiful example of God's creativity and I wanted to share it with you. Here is a great article on Catholic Exchange on Saintly Survival of the Teen Years. My children aren't teenagers yet, but already I feel like I have some of these problems. What did Saints do with cranky, attitude-having children? 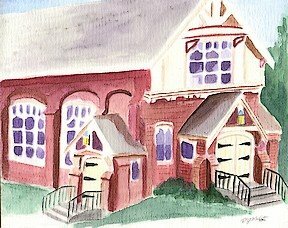 I am giving a watercolor workshop at the Center for Spiritual Direction on Thursday. The workshop is designed to help people discover the creativity within them as well as to help them appreciate beauty that they may have missed in the world around them. In order to paint something, you really need to pay attention to it. In paying attention, you discover so many things that you may have previously just skipped over. In preparation for this workshop, I spent some of today gathering up objects that I thought would be interesting to paint. I went out for a short walk this evening gathering some of the colored leaves that have fallen recently. Most of the time, I just pass by the piles of leaves without much of a second thought, other than "Ah, yes, it is raking time again," but today as I looked closely I could appreciate all the different variations in the leaves - their shapes and colors. They were really very beautiful. And so it is with so many things. There is just so much beauty around us if we take the time to stop and take notice. I just posted a review of The Final Harvest: Medjugorje at the End of the Century by Wayne Weible. This book was published in 1999 and covers the visions up to that point. For more up-to-date information, please visit www.medjugorje.org. Mary's message is so important. Please take the time to find out more. Commonweal just posted a very interesting article on The End of Education. In it, Alasdair MacIntyre, a professor at Notre Dame, argues that American Higher Education has become too specialized, that we need to instead embrace a model of education that would allow students to see the interconnectedness of ideas and subjects. I have long felt that this should be the case. The best class I ever took was as a senior in high school. For two hours every day, my classmates and I would sit in front of Fr. Richard Riendieu in a combination theology / humanities class. We studied culture - theology, art, history, music, literature, and philosophy - and how they informed and influenced each other. It taught us connections and opened up new worlds for us. If such a curriculum could be duplicated in other high schools and colleges, I think students would benefit greatly from it. Reading the paper in the morning is so discouraging. There is news of the war and of increased nuclear tensions, of global warming, and local crime. There is poverty and pain on almost every page. Sin and evil seem rampant in the world. It can be so overwhelming at times, especially when it seems there is so little we can do to change any of it. Especially for those of us who live our lives primarily within the domestic sphere, our power and influence can feel very insignificant. And yet, there are things we can do. In the past century, Jesus appeared to St. Faustina and Mary has appeared to the young children of Fatima and the people of Medjugorje. In all of these visions, the message has been the same. We must pray and sacrifice for our own salvation, to help save other souls, and to help change the course of world events. Prayer and sacrifice - it seems so simple, doesn't it? But we often put up obstacles or make excuses not to do it. Who has time for prayer? There are children to feed and a house to clean and work to do and volunteer projects to attend to. Sacrifice? No one talks about sacrifice anymore. Life is supposed to be about self-fulfillment. We work hard and are tired. We deserve good food, the best entertainment, the finest things we can afford. Yes, the message of Jesus is one that is as counter-cultural today as it was two thousand years ago. The truth is that we do have time for prayer and sacrifice. We need to make the time. Prayer is the foundation of all that we are and all that we do. When we dedicate some of our time to prayer, God will make the remainder of our time more fruitful. We will operate with God in His plan for the world. We also have many opportunities for sacrifice. We can give up something that we enjoy on certain days of the week, television or shopping or dessert for example. In addition, we can accept the crosses that come our way willingly rather than raising a ruckus. We can serve our spouses or our parents or our children when they ask us to even when we would prefer to be doing something else. We can listen patiently to another person who wants desperately to talk. We can be kind. We can be loving. We can choose to give of ourselves instead of looking for what we can get out of a situation. We can then offer these sacrifices to God as small gifts. Prayer and sacrifice are something each one of us can do, no matter what our age or circumstances in life. With them, we have the power to help change the world, a little bit at a time. Jesus and Mary have told us this is true. What better authority could one ask for? I just found out that one of my nephews is on suicide watch. He has been given anti-depressants and is under medical care. Please pray for my sister and her family. In Jane Brody's syndicated health column today, she was talking about how 1/2 of all pregnancies are unplanned. Her position was that this was an outrage because of all the contraceptive options out there. She then went over each option in detail, weighing the pros and cons of each (natural family planning was conspicuously absent from her list.) Her argument was that no woman should have to face being pregnant unless she had chosen to become so. She then postulated that there would be no need for abortions if this were the case. And yet, I wonder how we got to this point, where children are no longer regarded as a gift from God, but rather as a burden to be contended with or to be fit into life when the time is right. You can't plan on a gift and if you are sexually active, you need to accept that possibility that a gift may come. If God sends you a child, God will give you the strength to make it through the day (yes, one day - life and parenthood can often be only handled one day at a time). Perhaps that 50% unplanned pregnancy rate is just God showing us that He is still the one in charge of giving life. If He wants to send a baby, one will be sent, and God has a purpose for every soul He sends to this earth. Regardless of the circumstances of the conception, every child is a child of God and loved by God. Five-year-old David climbed into bed with us early this morning. He said "I had to go to the bathroom, and then I was coming in here to tell you I was blind, but then I opened up my eyes and I realized that I could see!" I spent a good part of my day laughing over that comment, but I also realized that there is some truth to it. How many times do we walk around with our eyes closed? We choose not to see the truth of a situation. We fail to acknowledge the pain and suffering of someone close to us. We don't see the joy present in a given situation. We don't see God working every day in our lives. We, too, can be blind. But we can also open our eyes. God invites us to see and fully experience life with its full spectrum of colors. Will we accept the invitation? This was sent to be by Janet Cassidy today and I thought it was good so I am sharing it with you. Send an e-mail to cassidycomments@yahoo.com with the word “subscribe” in the subject line if you would like to receive future issues of Cassidy Comments. Our adult son was rushing out the door to work this morning and he was throwing on his shoeboots and tying up the laces. I stood there and watched him, recalling what a challenge it was for him to master this task when he was little. Time is a good yardstick against which we can measure that kind of progress, but, I think we have to be careful to watch what we are using for a measuring stick for other things in our life. For instance, if you are over forty, you shouldn’t use a 20 something as your model for vitality or freedom. It’s always dangerous to use people as your measure anyway, because too often we pick the ideal against which to measure ourselves, and without fail, we simply do not measure up. If you find yourself longing for the way things once were, or the way you were, you might find comfort in reflecting on this: At every moment in your life, you are in process. You are becoming. The question is, becoming what? Separate those words and see where your thoughts take you. Allow yourself to investigate what it is to become something/someone, and contemplate the purpose or destination given to that progression. A friend of mine gave my husband a booklet entitled Our Lady Teaches About Prayer at Medjugorje by Rev. Albert J.M. Shamon. I admit, I have only a nodding acquaintance with the Marian apparitions that have been going on there for over twenty years. The Church has never endorsed them (as for example it has with the apparitions at Lourdes or Fatima), yet millions have made pilgrimages there. I have to say after reading this booklet that the message of Mary being promulgated is entirely consistent with her previous messages, except that there is even more urgency to her requests. Our world is in such trouble. I encourage you to order this booklet: Our Lady Teaches About Prayer at Medjugorje or to pick up a book about Mary's message at the library or to search online. Bernie did pick up several other books at the library that I plan to get to soon and that I will no doubt be sharing with you. 1) Pray, pray, and pray some more - pray because our salvation depends on it, pray to meet God, and pray for sinners. Pray that God's will be done. Pray out of love. Spend time with God for the same reason you want to spend time with people whom you love. 2) Repent your sins - go to confession. Face your human weakness and ask God for forgiveness of your sins. As I indicated, I will pass on more information as I learn more. Stay tuned. Where do Possessions Rank in our Lives? Jesus tells the rich young man to "Go, sell what you have, and give to [the poor] and you will have treasure in heaven; then come, follow me." (Mark 10:21) This instruction from Jesus always leaves me feeling somewhat uncomfortable. After all, the rich young man was not a bad guy. He followed the law and the prophets, and was actively seeking further knowledge about how to follow the Lord. I identify with that rich man a little too much. I wonder if Jesus showed up today and told me the same thing, if I, too, would walk away sad. And yet, in some respects, through this Gospel, Jesus is doing just that. What am I willing to give up for Jesus? It is a thought-provoking question. I try to be generous with my money and my time, but could I do more? Absolutely. I just finished reading "No Greater Love" by Mother Teresa (New World Library, 1997). In this handbook on how to live in the footsteps of our Lord, she encourages us to be generous to the point that it hurts. She also tells us that the poor have much to teach us. Even in their poverty, they are not bitter. They are happy with what they have. When something is given to them, they are eager to share with those who have less. Yes, I can learn from that attitude. For even though I try to be unattached to my possessions, the truth is that I rely on them much more than I care to admit. I like my home, my comfy couch, and the soft mattress where I lay down my head. I take for granted that my refrigerator and my cabinets will be full of food. I have a computer and a television and a cell phone. It can be argued that modern American life requires most, if not all, of those things. But the same things that make our life easier and more enjoyable can also hold us hostage. They can keep us from loving the way Jesus loved. They can keep us preoccupied with the things of this world. Jesus challenges us to keep our possessions in the proper perspective. People come first: the people in our families and the people on our streets. We should give whatever we can to the poor. We should give not only out of our excess, but rather to the point that we actually feel it. We should always put spending time with our children and our spouses over spending time with our high-tech toys. We should realize that our possessions will never bring us true happiness, and that the quest for additional possessions is a losing battle. There will always be something else to reach for. If we spend our time and our energy chasing after the things of this world, we can't expect to be building up treasure in heaven. What matters more? Like the rich young man, Jesus gives us much to think about. Will we walk away sad or will resolve to stay the course and follow the Lord where he invites us to go? 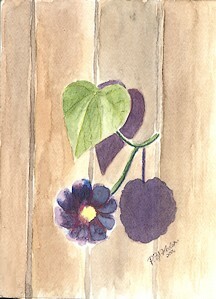 A few weeks ago, I spotted this one tiny purple flower poking its head through our back fence reaching for the sun. The flower only lasted one day, but it was so beautiful - such a reminder of how God cares for even the tiniest of his creation. I took a photo of it and just completed this painting which I am donating to my son's school's craft show for this year. Do Lavish Weddings take away from the Religious Significance? I read an interesting article in the Novemnber issue of U.S. Catholic (as of today, the article is not yet on their website) on whether lavish weddings take away from the religious significance of the ceremony. Peg Conway presents the case that the modern marriage ritual needs some reworking with a greater emphasis on the sacramental aspects of the wedding. She encourages couples to take a more active role in the liturgy that accompanies their marriage - for example, doing the readings or bringing up the gifts, and perhaps going back to simply having two witnesses rather than an extensive wedding party. She even suggests having weddings be part of a normal Sunday liturgy much as baptisms are often celebrated. She says the cost of the average American wedding should be reduced because it is an unfair burden and not necessary. I know even as I got married 9+ years ago, I lamented the cost. Although compared to many weddings, we did stick to a budget and my parents and my husband and I split the cost. I would have been perfectly happy with a very small wedding, but my parents really wanted to invite our extended family, and in a sense, it was their day, too, to throw a big party. Looking back, it is wonderful to have those memories and the photos to show our children. Getting married is a big deal and I think it should be celebrated, although obviously some people have gone way over the top with the whole celebrating concept. I do like Conway's idea of incorporating the bride and groom into the liturgy more as well as inviting the larger faith community to witness your marriage via Sunday mass. What do you think of Conway's ideas? Please post a comment and let me know. These words from Psalm 139 remind us that we are special. It is so easy to forget that fact in the busyness of daily life. God made each one of us. From the time that we existed only in the mind of God, to our conception and birth, and every day of our lives, God has created us to be special. We are walking miracles! Remember that the next time life is weighing you down. From the time our children are born, we are forced to make multiple decisions every day about their well-being: what food to give them, what clothes to put on them, what to read to them, whether or not to let them watch television and if so, what shows are appropriate, and what toys they should have, to name just a few. As they get older the decisions just get harder: what activities to get them involved in, what permissions to allow, and how best to discipline. Each decision has its consequences and sometimes it is so hard to know if you have made the right one. If only children came with instruction manuals! To make it even more challenging, whatever decisions you make with your first child may or may not be the right ones for subsequent children who come with their own distinct personalities. I try hard to do what I feel is best for my children. I figure I only have one shot at this parenting journey so I need to do it right. I read parenting magazines, talk with friends whose parenting styles I respect, and most importantly, pray to raise my children to be who God wants them to be. Yet, even with that, I suffer from bouts of parental uncertainty. One of the most difficult decisions I have struggled with to date is what to do about my children's education. I have home-schooled my children for pre-school. I was first introduced to home-schooling when David was a year and a half and Isaac was just a tiny baby. A copy of "Home Education Magazine" came in the mail to me. I had heard of home-schooling but didn't know much about it. I pictured isolated children sitting at desks poring over boring texts, subjected to parental pressure to the extreme. This magazine shattered that image. Here were happy children actively engaged with life. I wanted to know more so I began taking every book out of the library that had anything to do with home-schooling. I became more and more convinced that this was the way to go, at least for pre-school. Learning about home-schooling helped me be a better parent. I learned to appreciate my children's unique learning styles. I learned to let them take the lead regarding what activities they wanted to do on any given day. I learned to integrate learning with life and broke myself of the notion that education only takes place in a school or when using educational books or toys. I learned that the world is an incredible classroom. Yet as David approached Kindergarten age, I struggled with whether to send him to our parish school or to continue home-schooling him. I prayed novenas, spoke to my spiritual director, and tried (unsuccessfully) to hook up with other home-schooling families. I also faced my own lack of courage. Not sending my children to pre-school already made them and me different from 99% of the families around us. I'm not that good at standing out from the crowd. I worried about dealing with our local public school system to provide the needed documentation of our classwork. I worried about standing up to my parents who were against my decision to home-school. I also worried about taking full responsibility for my children's education. If I screwed up, there would be nobody else to blame. The tipping point was that David said that he wanted to make some friends. He did have some, but I guess he wanted more. Ultimately, and with much angst, I registered him for school. Six weeks into his first year of school, I am still not sure I made the right decision. For the first three weeks, he came home nearly every day saying how much he hated school. The past couple of weeks have been a little better. There are some good things about his being in school. He really enjoys his physical education class which he has twice a week. He looks forward to his library and computer classes. He also gets to go to monthly mass with his eighth-grade buddy whom he seems to have really connected with. He has made a couple of friends, but he really doesn't have much opportunity to talk or play with them at school. He gets to see them when he goes to soccer practice and games (something he would be doing even if he were at home). I am enjoying being part of the school community as well. Most of my friends from Church have their children in the school so now I get to see and interact with them more. On the downside, David leaves home and comes home stressed almost every day. David's stress level is pretty high to begin with and school has not helped. As a result, he has an attitude I can definitely live without. He also has started tormenting Isaac whom he had always gotten along with very well. I end up having to punish him and that makes life unpleasant for everyone. I'm exhausted by the tears and the battles. I can almost see him decompress every weekend. By Sunday, he is back to his normal self, only to have to return to school the next day. I can also already see peer-pressure taking root. He wants to be like the other kids, which I understand. Is that a good thing? Not necessarily. He has already been indoctrinated with the idea that school is where you learn and the rest of life doesn't matter all that much. As for his actual education, he is learning, but not anything that couldn't be taught just as well, if not better, at home. His teacher has to deal with twenty children. Obviously, she can't give them all the attention they need to reach their full potential. So, I am still praying. I pray for him to get up willingly in the morning instead of having him burrow under his covers refusing to get out. I pray for him to have a good day at school, to come home happy, and to be a "nice David" when he gets home. The prayers have been helping somewhat. I'm going to keep him in Kindergarten for this year, but I don't know what to do about next year. I know I have time to make a decision. I need to breathe and "Let Go and Let God." Sometimes that is much easier said than done. I know that the answer will come. If the answer is to home-school, I need the courage to face all my own worries and insecurites. If the answer is to continue to have David (and later, Isaac) go to school, then I need to feel more comfortable with that lifestyle. God always gives us what we need, but in His time, not ours. I also know that He won't let me go wrong with my children, at least not in the big things, as long as I keep praying to do His will. I still wish I had that instruction manual for my children, but in the meantime, I think I need to get used to parental uncertainty. I don't know how any of my decisions for them will play out in the long wrong, but I need to trust that God knows what He is doing. He gave these children to me for a reason. Together, we all will make it through. I came across this group today (ironically enough in an article in a woman's magazine that was trying to work against them.) The Susan B. Anthony List is working to increase the number of Pro-Life women in Congress. Unfortunately, so many people feel that in order to be a feminist, you need to be Pro-Choice. All I can think of in response to that is the famous quotation "How sad it is to need to kill a baby in order to live the life you choose." In any case, this group is seriously underfunded and no where near as influential as that other "list" group, which shall remain nameless because I don't want to give them any publicity, that works to keep Pro-Life candidates out of office. Hopefully, in time, that tide will change in our favor. Today (October 4) is the feast of St. Francis of Assisi, a twelfth century saint known for his life of radical poverty and his work to rebuild the Church. He was also well-known for his love of animals. He is the patron saint of the environment. Here is his prayer for peace, something that we so desperately need in our world. I invite you to spend some time with these words, and imagine what life might be like if we all lived life according to them. I had such a rough day with David. My little Eeyore with the dark cloud hanging over his head was stressed from the time he woke up this morning at the very early hour of 5:40 a.m. He climbed into bed next to me and began his litany of complaints. Isaac was still sleeping so David and I had some quiet time before school. I eventually had him calmed down and off to school. After school, however, his mood hadn't improved. If anything, the stress of school had made it worse. He just walked in the door, laid himself down on the floor and wailed. The rest of the day it was off and on. He'd be Ok for a little while and then something else would trigger a breakdown. By the time I had him tucked in bed tonight, I was exhausted and frustrated and at the end of my patience. I couldn't help but wonder where I had gone wrong as a parent to have David see the world as such a threat to his existance. And yet, at the same time, I know that he was born this way. Even as a tiny baby, his stress level was high. "The mother's love reminded me of the miraculous way in which God whispers his love into the hand of each of us when we are born, placing there a promise that, no matter what, he will never let us go. And having pledged that love to us from our first breath to our last, he wraps our fingers around that promise for safekeeping." Yes, God loves my David just as he is, and so do I. My spiritual director always tells me to trust that God has a plan for my children. I know that is true. My part in that plan is to get up every day and love my children to the best of my ability, and to trust that God is holding on to me as well. I read recently that the Rosary fell out of favor among many Catholics after Vatican II. Thankfully, my family never got the memo. The Rosary has been part of my daily prayer life for as long as I can remember. As a child, I said one decade for each grade of school I was in, until I was ten and was old enough to say a full five decades a day. This is a tradition I am continuing with my own children. As a teenager, my mother would wait up for me so that, even if it was midnight when I came home, we could say the Rosary together before we went to bed. The Rosary would become my daily companion, my strength when life got tough. The simple meditative prayers, and the grace that God provided through them, got me through so many challenges. At times in my life when I needed to make major decisions such as whom to marry or when life has been tinged with pain, I turned to the fifty-four day Rosary novena, a commitment to prayer which has never let me down. Over the years I have said the Rosary counting on my fingers in the middle of the night while feeding a baby and while buried under the covers on cold winter mornings. I think that I have even said it in the shower! These days, I say it first thing in the morning to get my day off to a good start. October is the month of the Rosary with the feast of our Lady of the Rosary falling on October 7th. In the 4th grade Religious Education class I help to teach, we are introducing these young people to the Rosary. While three of the students had rosaries, none of them knew how to use one. I went out today to purchase little books for them that include how to say the Rosary, the text of the prayers, as well as beautiful illustrations of the scriptural mysteries to meditate on. We are going to have them make their own Rosaries and then have our Pastor come to class to bless them. I don't know if any of these children will develop a lifetime devotion to the Rosary as I have, but I hope that they will come to appreciate the beauty of the prayers and know that they can lean on them whenever they need to. Today is the Feast of the Guardian Angels. Maybe you haven't given your Guardian Angel much thought lately. Isn't it comforting to know that we have an angel right near us appointed by God to help watch over us and that our children have one, too! I've been taking a little bit of a break the past couple days. I finished this painting last night of the Elms College Chapel. I've also been working on Halloween Costumes for the kids - Isaac wants to be Cookie Monster. He has wanted to be Cookie Monster for the past two years and I wasn't able to find a reasonably priced costume so I decided to make one. When I took the boys to the fabric store to find blue fuzzy material, David caught sight of green fuzzy material and said "Look! I can be Oscar!" so now I am making two costumes! They are coming out reasonably well, however. I think the boys will look very cute when they are done. There is a Halloween Party at David's school and they are both so excited to go. On the reading front, I have been enjoying a tome I picked up a couple of weeks ago at the library (there wasn't much in the theology / spirituality section that day) - "Old Books, Rare Friends" by Leona Rostenberg and Madeleine Stern. It was written in 1997 by two elderly women who were the best of friends and shared a lifelong love of reading and books. They went into business together as rare book dealers back in the early 1940s. As someone who enjoys books and history, I am finding it fascinating. One quote cemented the fact that I had found kindred spirits in these women. Leona wrote of going to the library when she was young: "Proudly I marched off with my selection, still sniffing the musty odor of books, a smell that was somehow warm and comforting and exciting all at once and would remain with me forever."